Saks created it’s own shoe zip code (10022-SHOE) and Skittles created the rainbow. 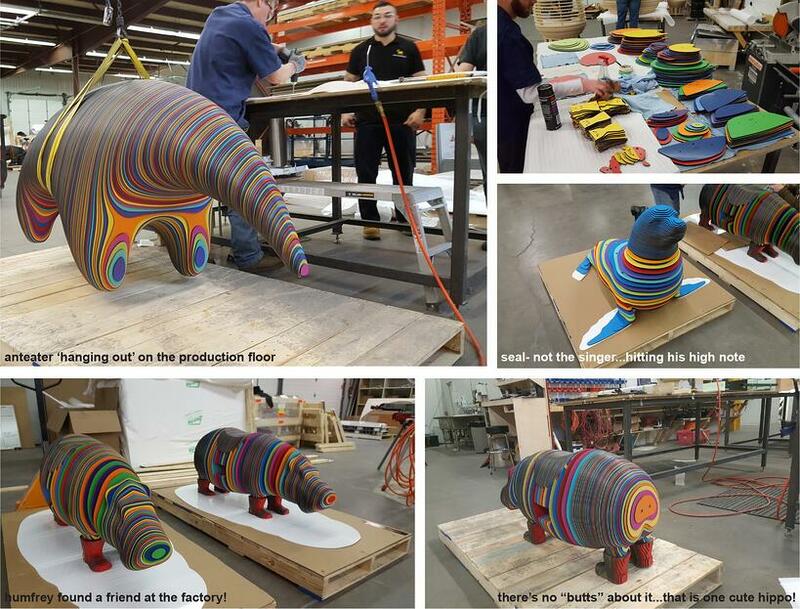 YGD created the best of both: a rainbow hippo with boots! Meet Humfrey and his friends Anteater and Seal- Not the Singer: the latest innovative kids play designs from our Rainbow collection. Roadtrip anyone? 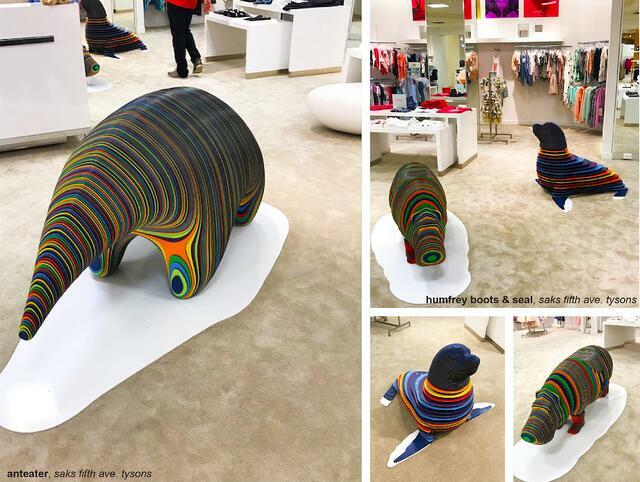 Head to Saks Fifth Avenue at Tysons Galleria in Washington, DC, USA to taste the Yellow Goat Design rainbow! GGP’s Tysons Galleria shopping center is a destination for millions of tourists who visit the nation’s capital each year. Saks, an iconic retailer since1924, knew they had to step it up for that kind of audience. They called on YGD to showcase our bold, original creations to elevate the children’s department. Saks requested 3 designs that would align with their unparalleled style: Anteater, Humfrey Boots and Seal- Not the Singer. Obvious choices...they are silly, super fun and definitely stylish. Built and assembled from layers of vibrantly colored High-Pressure Laminate, these pieces are impervious to almost anything- including weather, water, graffiti and scratching! Anteater: measures 5’-10” x 2’-3” x 3’ and needs to consume thousands of insects daily to meet caloric intake requirements…good thing ours runs on rainbow skittles. Humfrey with Boots: measures 4’-3” x 1’-6” x 1’ and is much fresher than a fox in socks. Seal- Not the Singer: measures 3’-9” x 3’-9” x 2’-7” and prefers “Kiss From a Rose” as his theme song. YGD’s “Rainbow” collection features a range of animals, play structures and seating for all types of super cool spaces. Each item can be customized in size and color and modified to suit your region. Saks started the trend (no surprise there…#saksstyle) but we encourage you to follow suit! Shop at Saks 24/7 here. Take to Tysons here. Give GGP locations a go here. See more kids play here. *Note: the “Rainbow” collection can be customized to suit your project. Items shown are conceptual and may require modifications and certification to suit your region. Where applicable, suitable fall zone and impact attenuation surface will be required subject to certifier’s recommendation. Suitable for interior and exterior use.